The Preliminary Entry Form of the NAC must reach the Organizer at least 75 days prior to the start of the competition, i.e. by May, 25th 2017. The Official Entry Form of the NAC together with the entry-fee payments must reach the Organizer at least 45 days prior to the start of the competition, i. e. by June, 24th 2017. Please note the additional “Attachment Form” with organisational details to be completed for EACH attending person.  Before submitting the Official Entry Form (OEF) each delegation must confirm on the FAI web site, http://www.fai.org/about-fai/fai-sporting-licences that all the COMPETITORS are registered. The name and FAI Licence number of each competitor must be EXACTLY as registered on the FAI data base. Both registration forms are attached as papers to Bulletin #1 and are available in electronical form (in format EXCEL 2007) on this website (see box on right side or below on mobile devices). The registration by internet is the preferred method. Payment must be made in EURO (EUR) by bank transfer. Bank charges to be paid by the sender. All forms with detailed payment instructions will be published with Bulletin #2 not later than 1st of May 2017. If a team wishes to arrange accommodation and meals (except Lunch and Farewell-Dinner at competition side) by themselves, than 300,- € per participant is deducted from the “full board”-option.